Solaire Infrared Grills are the Best Hot Grills available. The high heat of the Solaire Infrared Burner cooks at a fraction of the time of conventional grills and makes food juicer and more flavorful. Solaire grills are perfect for grilling full meals or just using them for searing after sous vide, smoking, or other cooking methods. Built In: W = 36", L = 28 1/4", H above counter (Hood Down) = 14 1/2", H above counter (Hood Up) = 26 1/4"
Standard Cart: W (Shelves Down) = 42 1/2", W (Shelves Up) = 60", L (Hood Down) = 28 1/4", L (Hood Up) = 28 3/4", H (Hood Down) = 49 1/4", H (Hood Up) = 61"
Premium Cart has the same dimensions as Standard Cart. The grill ships fully assembled. It only needs to be removed from packaging, placed outdoors in the desired area, and connected to a source of gas, either Propane or Natural gas, depending on which type is ordered (it can be converted later after the purchase of a conversion kit if your gas needs change). 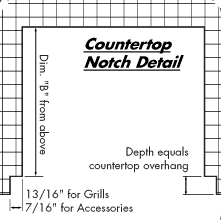 For more information about setting up and using a Solaire grill, see this page for the care and use manual, which a physical copy is also included with the grill. Is your island made from combustible material (such as wood or plastic)? You will need the Insulated Jacket, Item #SOL-IRIJ-36 (see item for cut-out dimensions). 34 1/2" width, 23" depth, 10 1/4" height. Click the button below to add the 36" Solaire Infrared Grill (Premium Cart with Rotisserie Pictured) to your wish list.